I look around this place and think, this is all wrong. How did we get to this point? All of us so isolated from life, we don't even know where our food comes from? We don't even know what is in our food, what preserves or seasons it. Who has handled it, or from what corners of the planet it was flown, sailed, driven or railroaded. We don't know what it is! Rats fed through tubes by unseen, sometimes malevolent hands. I look at the systems that create our inner voices- our schools, our workplaces, our daily journeys, our media, our stressed parenting, underpaid, forced care and our crumbling under-resourced human support systems and see failure, punishment, wasted lives, lies, drudgery, selfishness, separation, isolation, alienation and rats. I look for the hidden, grabbing hands who own and guide these things. I look for the malevalence that turns good and welfare into greed and punishment. I see punishment of poverty, punishment of mothers, families and disabled. I see the splintering, smashed families and human relationships. I see people living in boxes and walled runways, lashing out at the encroaching walls; the imaginary grabbing hands. I see the grabbing hands, invisible but all invasive and directing, stabbing and provoking in order to keep the rats focussed on each other's throats and the jealousy in the extra seed in the little pile of rodent food next door and not on who is making the misery for the profit of the few. No-one is looking at the hoarded freedoms and food and resources and power of the grabbing hands. I hear the lies about who we are, where we have been and where we can go, but see the truth on the streets, on our faces, in the rattling cups, in the labelled clothing, the Tesco burgers, the cheap tobacco, White Lightning and in death. I see the truth in the exclusivity of the good things in life. The exclusivity of freedom. The exclusivity of health, warmth and food, education and safety. 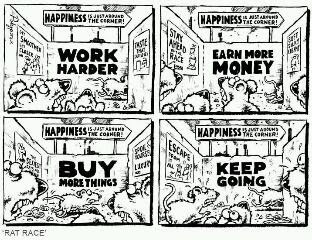 The narrative of capitalism. The "common sense" of misery and acceptance; the passing on of this through lack of imagination, fear and poverty to the next generation while the grabbing hands grab all they can. Handed over to our children, a world of increasing misery, drudge, blame, victimisation, fear, robbery and lies. Surely none of us really want this? A track that speaks of Thatcher and her boys, Blair, Cameron and Clegg's world - Depeche Mode, Everything Counts. Ambition... For the common good or for yourself?